I don't spend much time decorating at home so I thought it was time to put some things on our walls! Of course ... it had to be SIMPLE. SMART. SOPHISTICATED. and EASY! That's my criteria and it doesn't get any easier than this! 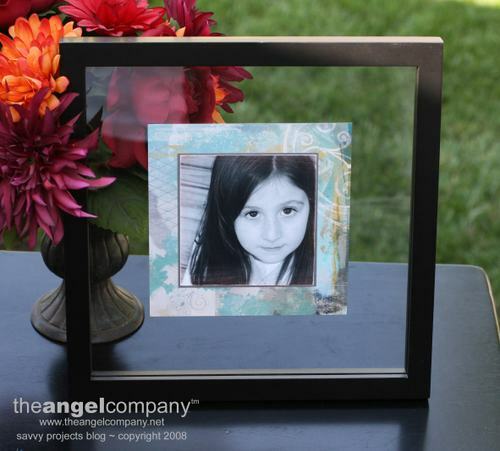 I purchased this frame at our local discount store and knew I wanted to use a series of these for my artwork (I LOVE THIS PHOTO OF SOPHIE!) so I purchased several the same size and got to work. I used Amberley Grace as my featured palette so I cut each sheet to approximately 6x6. 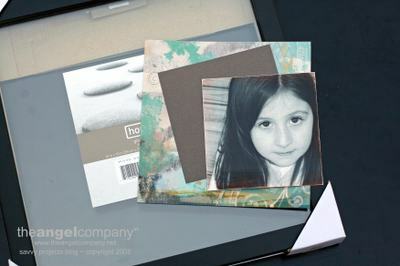 I used our Amberley Grace Gray Cardstock as a mat to enhance my photograph and I cut those to approximately 4 1/8 x 4 1/8. My photographs were simple! I took a 4x6 and cut it down to 4x4. OF COURSE, I sanded the edges of my photographs and then I matted them and inserted into the frame. This project is SOOOOO EASY! Most of my time was spent cleaning the glass before I inserted my photos. Wouldn't this be a GREAT project for Grandparent gifts! Or how about Mother's Day! I know at our house our favorite artwork is that which features one of our family members! Be creative and have FUN with this project! And remember that our papers are designed using the Pantonne Color Trend Forecasts so they ALWAYS coordinate with your decor and the upcoming Trends!